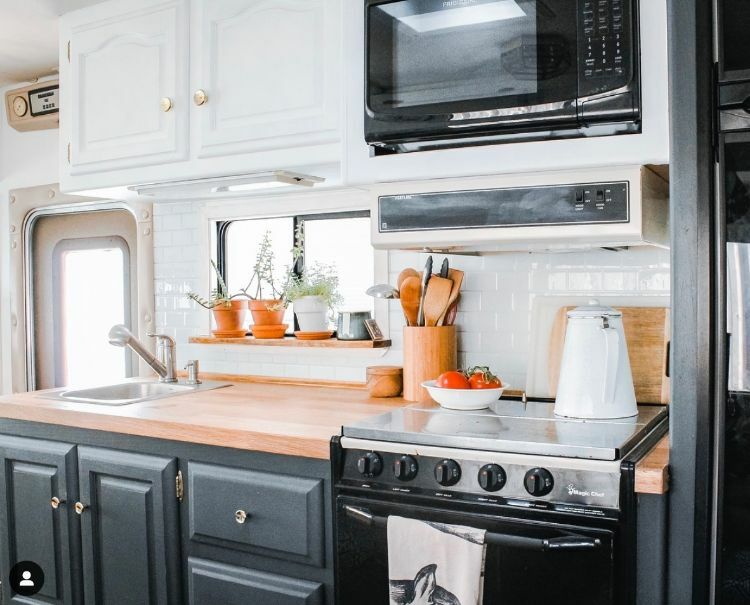 Leah and Brennan of Jacksonville, Florida, traded their house for a tiny home on wheels when they bought this 1989 Holiday Rambler RV and renovated it themselves. They live in it full time on the Brennan family blueberry farm, and they share the space with their two Chihuahuas, Grommit and Bimbi. 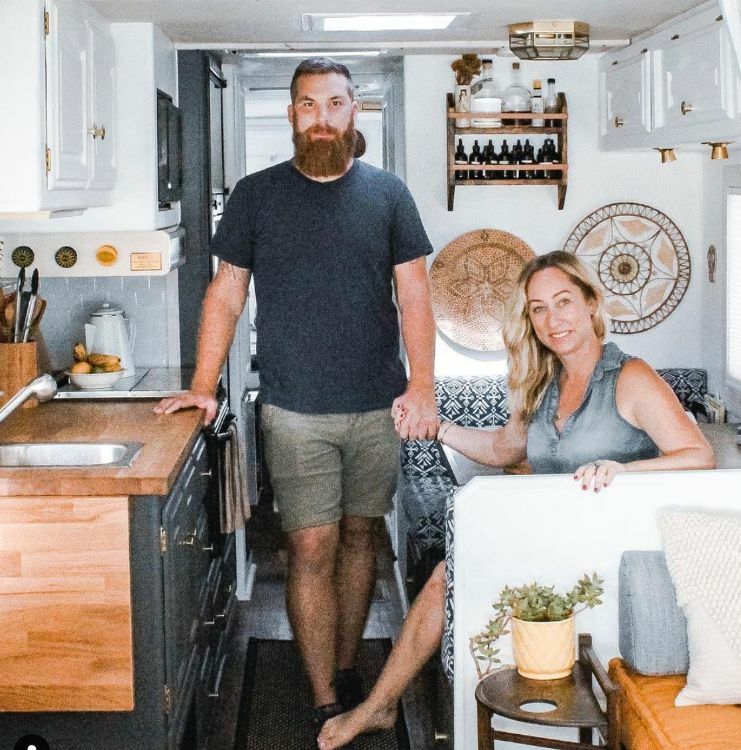 What this couple has done with the space in a vehicle just barely more than 30 feet long is amazing and inspiring to anyone who loves campers, tiny homes or design. 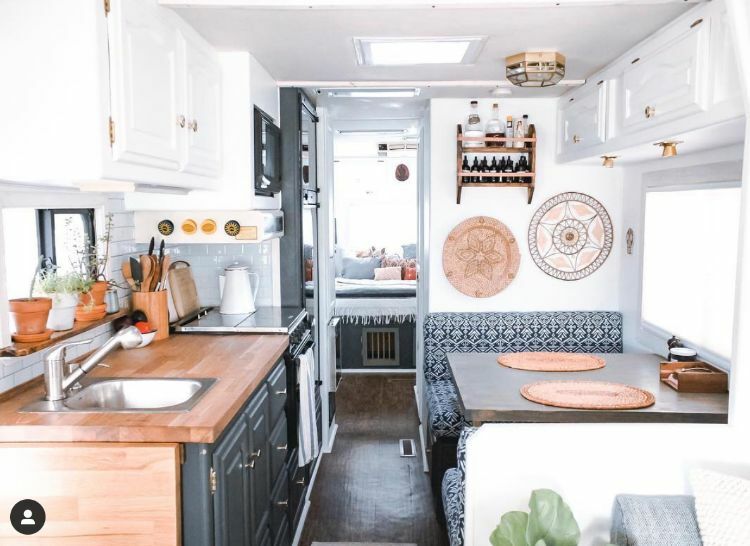 The finished abode certainly demonstrates how beautiful even an older RV can become for people with a vision and the willingness to do hard work. 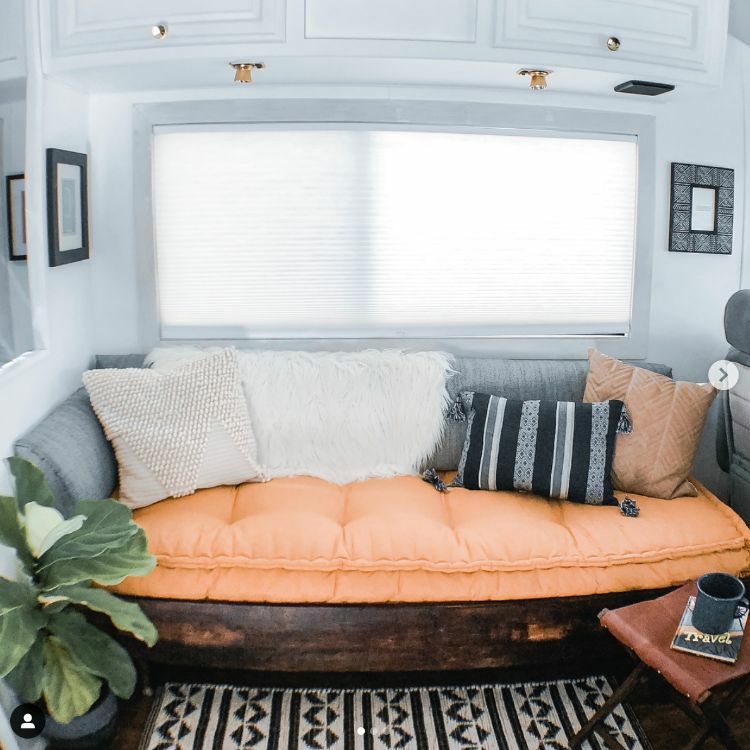 The decor is impressive and cozy, so it's no wonder they have chosen to call this recreational vehicle their home. After taking a look inside, it's likely you will want to move in too. 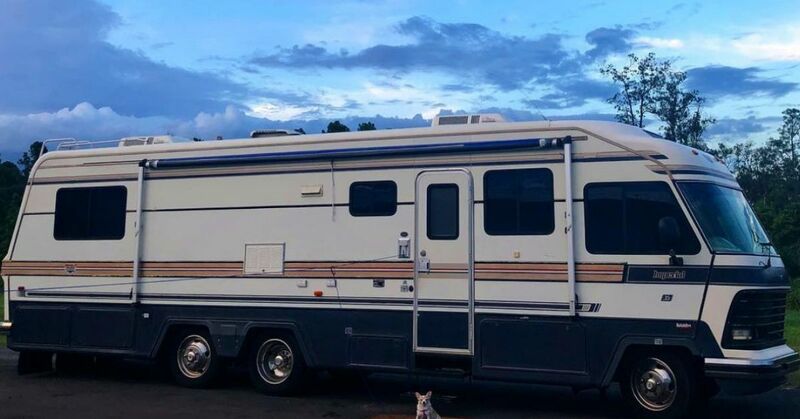 When Brennan and Leah purchased this RV in February of 2018, it needed a lot of work. In fact, it looked exactly like you would imagine a 1989 Holiday Rambler would look inside. It's pretty incredible to see the finished transformation, just eight months later, in October of 2018. The living room is the first thing you see when you step inside. 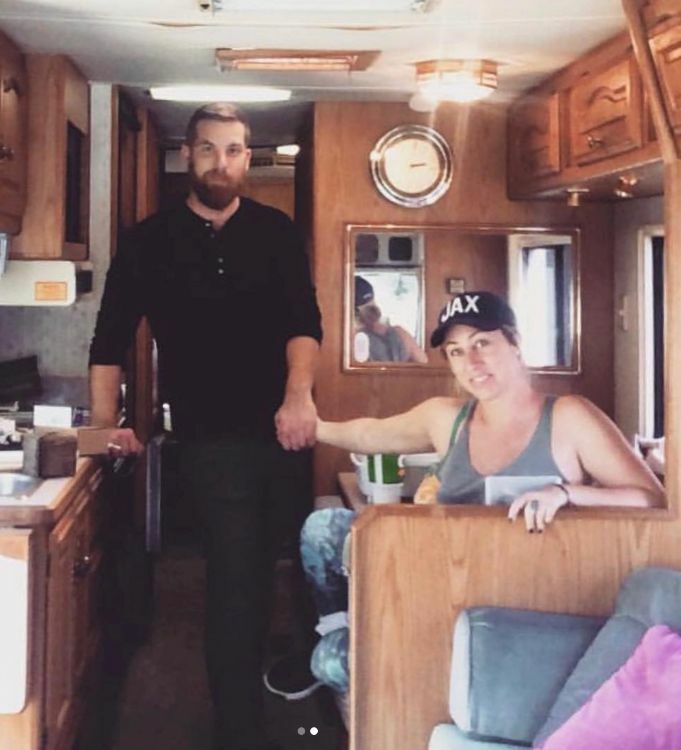 Leah and Brennan removed the existing couch and replaced it with this one they found on the side of the road. A new cushion, a few pillows and a soft, fluffy blanket make this comfortable replacement look inviting and welcoming. 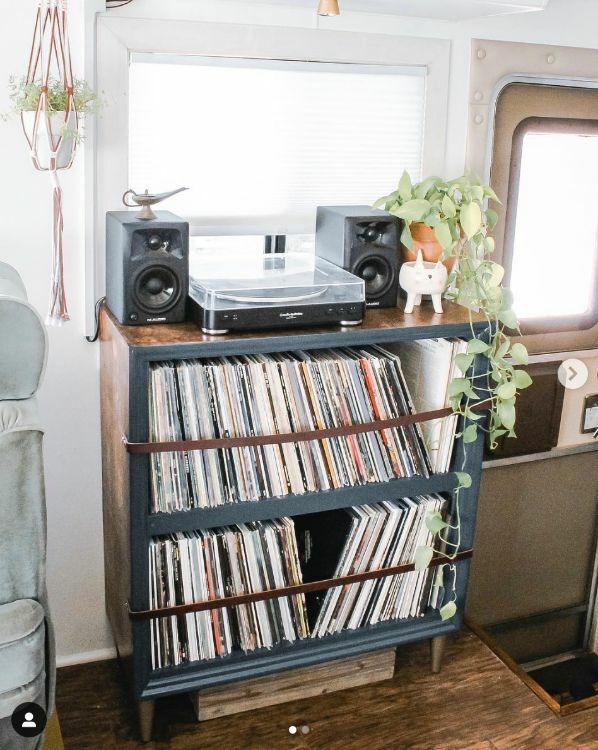 This record storage, with the record player on top, was created from an old dresser they found. 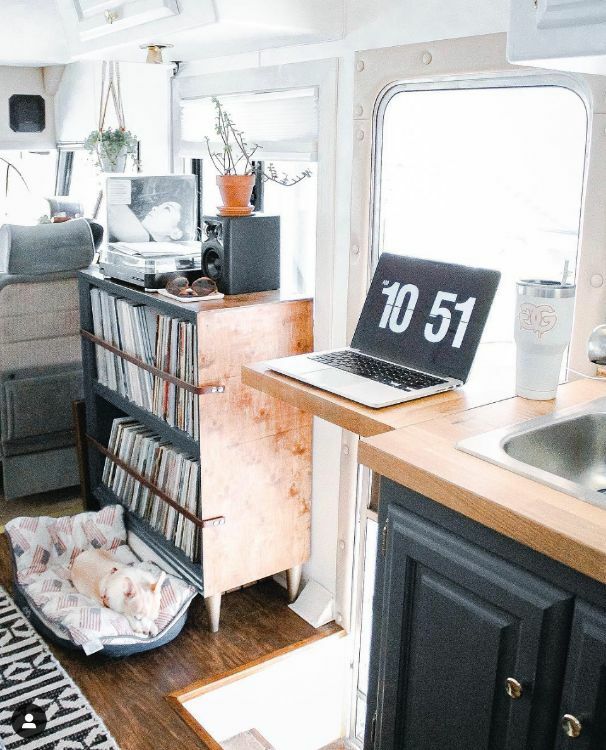 They removed the drawers, added the record collection, and made and added the leather straps to ensure none of the records would fall out while the RV is in motion. 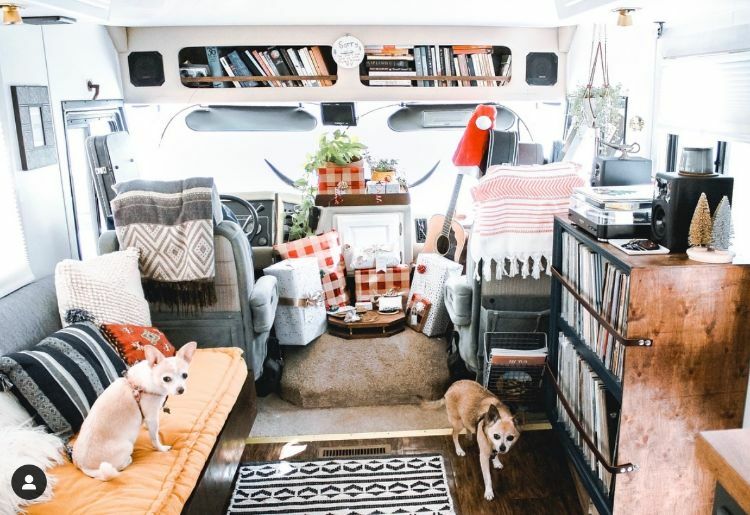 The small speakers are plenty for the tiny space, and the couple enjoys listening to music together frequently. Leah works from home on her computer as a social media manager, so she uses the kitchen counter extension as a standing desk. This allows her to look outside while she works while keeping an eye on the dogs lounging outside. 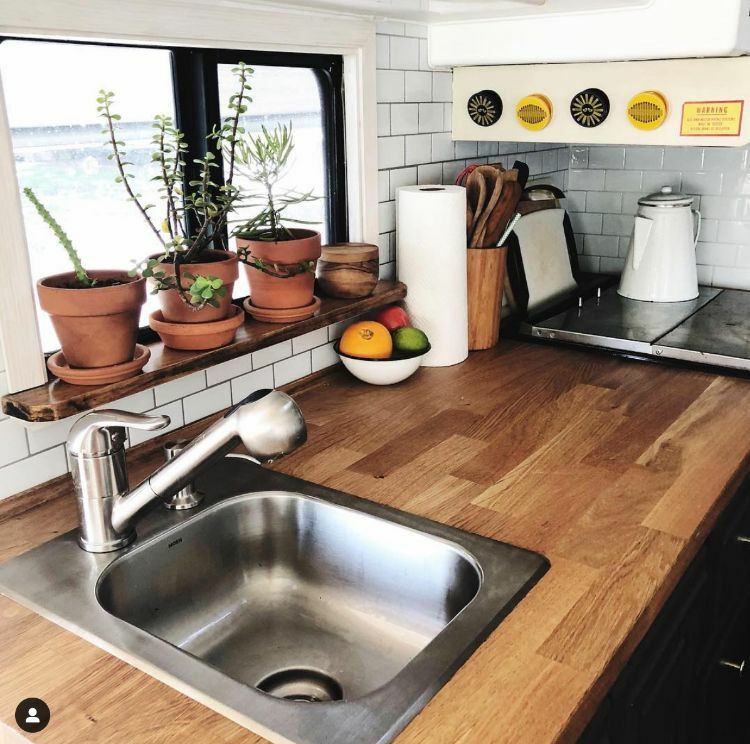 When renovating the kitchen, the couple decided on more counter space and a smaller sink. Although at first they were worried that the sink might be too small, so far it has worked out just fine. The compact appliances and uncluttered countertops make their kitchen space look huge. The contrasting colors of the upper and lower cabinets really work, and the hardware chosen offers a very clean look. Leah says Brennan does the cooking and she does the dishes, so they really make an excellent team. 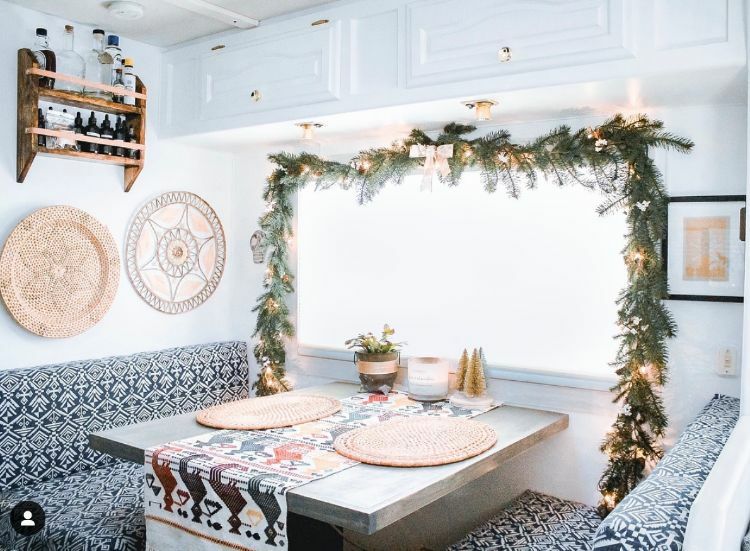 The fabric they chose for the seating in the dinette, paired with the table runner and eye-catching wall art, really gives the dining area a very homey feel. This table is so welcoming and seats four when necessary. 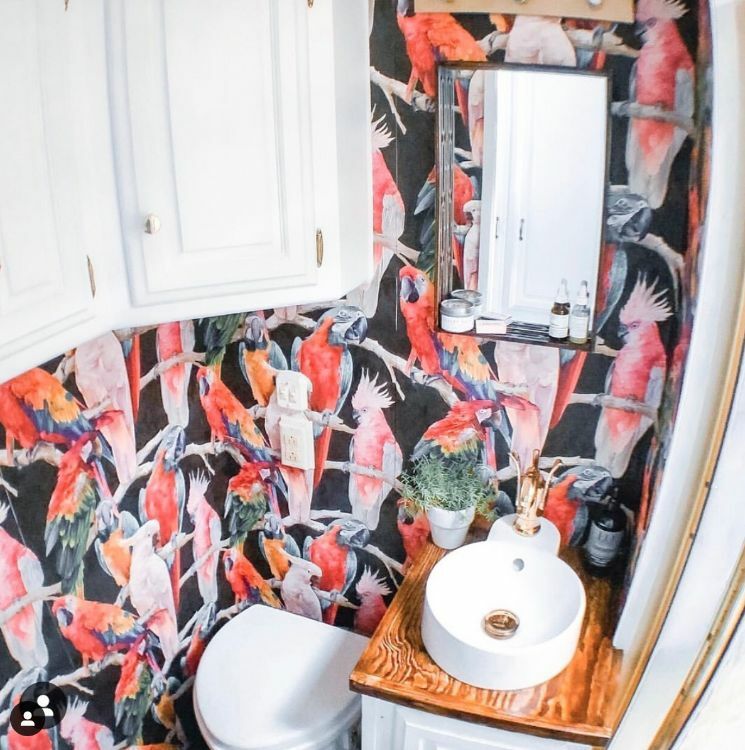 The bathroom is perhaps the most visually exciting part of this home. Just look at these brightly colored cockatoos and parrots. Although RV bathrooms are notoriously small, this one offers a pleasant environment for the couple and their visitors. The wooden counter of the vanity, combined with this simple round sink with a golden faucet, gives it a little extra class. 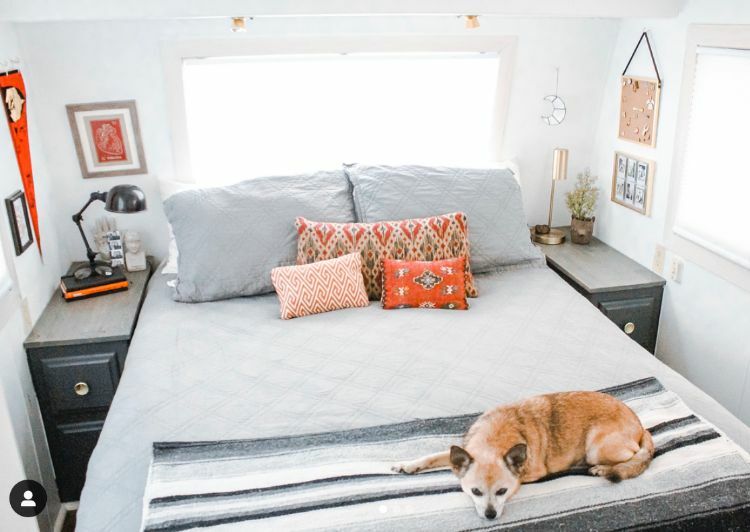 Their bedroom looks so roomy and is a favorite of the dogs. 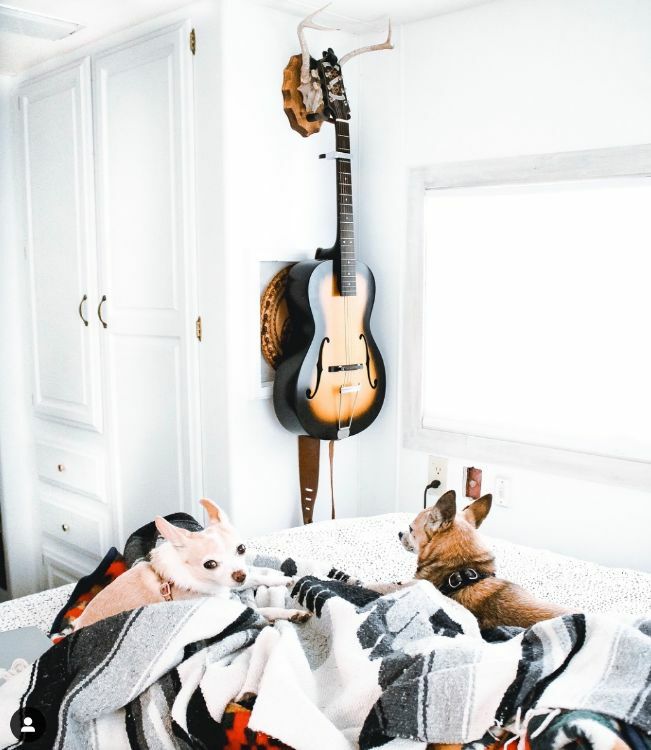 The nightstands and surrounding areas allow Leah and Brennan to each express a little of their individual personalities in their space, whereas the gray blankets and pillows serve to tie the room together. Brennan enjoys playing guitar, but in a tiny space, it's sometimes hard to safely store something so fragile and easily damaged. The couple came up with this practical idea to keep this beautiful instrument safe while still keeping it accessible for an impromptu concert.